SKU: RNC-1GAL. Category: Concrete Sealers and Cleaners. Tags: Concrete, Re-New Concrete, renew concrete. New Image Coatings™ Re-New Concrete for Concrete Restoration restores natural color and beauty to your concrete surfaces. Works on contact without scrubbing to dissolve and remove rust, mineral stains, iron spots and efflorescence. Scarifys surfaces and whitens concrete color. Apply Re-New Concrete for Concrete Restoration to aged or new concrete surfaces to remove stains and mineral deposits, or cover the entire surface for a new concrete appearance. Etch smooth concrete in preparation for Seal-Once™ Concrete & Masonry Waterproofer, staining and painting. Do not use if air or surface temperature is below 35 degrees F.
For best results surface should be free of all mold/mildew, dirt, grease, oil, etc. Stains will dissolve on contact. Re-apply to stubborn stains and lightly brush or hose off loose deposits. Apply full strength to aged concrete surface with a garden sprayer, no pressure washing or scrubbing required just hose off. 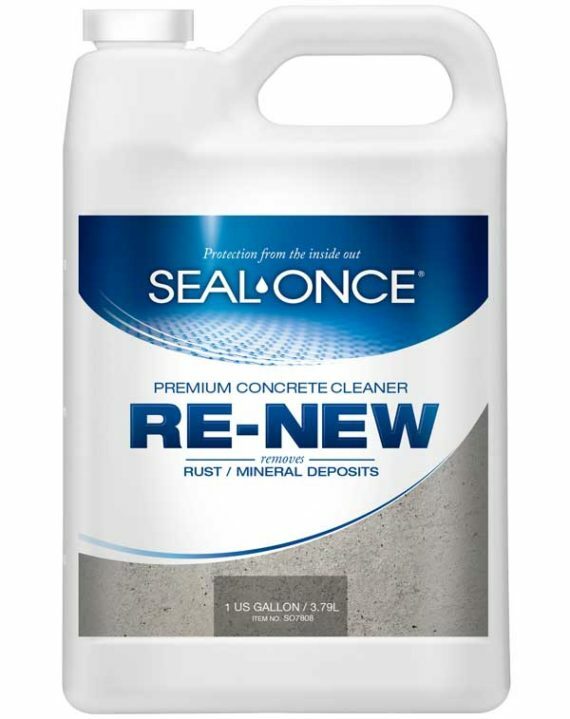 Use New Image Coatings™ Concrete & Masonry Cleaner prior to using Re-New Concrete for Concrete Restoration. To remove efflorescence pressure washing is required. If swallowed drink plenty of water to dilute. Do not induce vomiting, seek medical attention. Avoid extended contact with glass, etching could occur. Be the first to review “Re-New Concrete for Concrete Restoration” Click here to cancel reply.